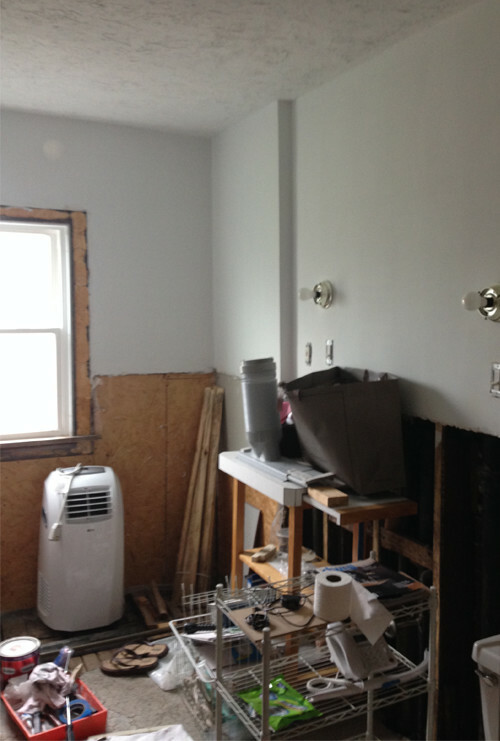 Many of us can relate to the angst of starting a home renovation project only to realize, after it’s too late, that we’re in over our heads. That was the predicament for these homeowners. 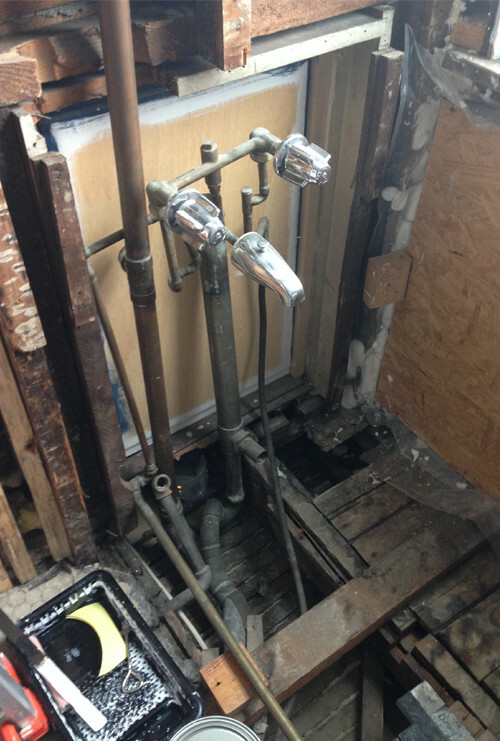 They had partially demolished the hall bathroom in their 103-year-old home before they found the project to be more than they could manage, from both a time and skill standpoint. 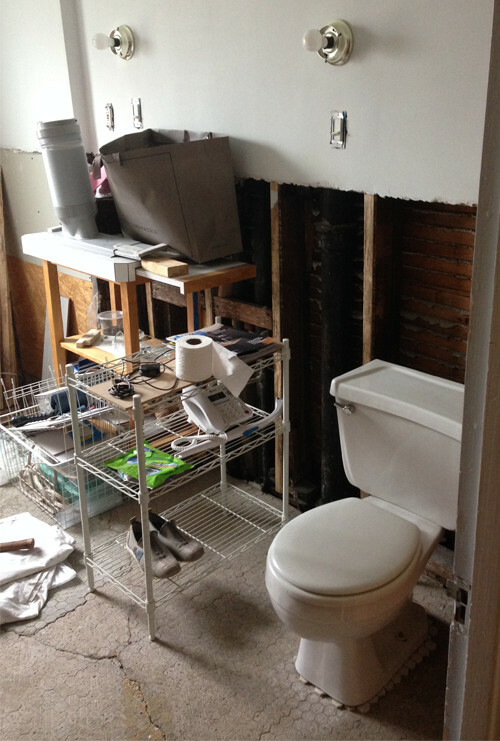 For four years, the mostly-demoed bathroom remained in that condition. 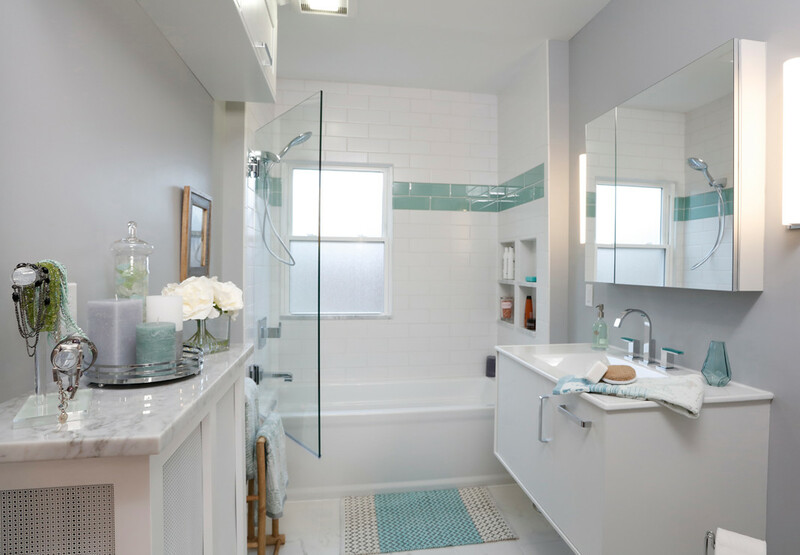 After years of having to go down to the 1st floor or up to the 3rd floor to shower, the couple turned to Dover Home Remodelers to help restore function in the bathroom and breathe new life into the dormant space. The project earned first place honors in NARI’s 2017 Contractor of the Year (CotY) Awards, Bathroom Remodel $30,001 – $45,000. 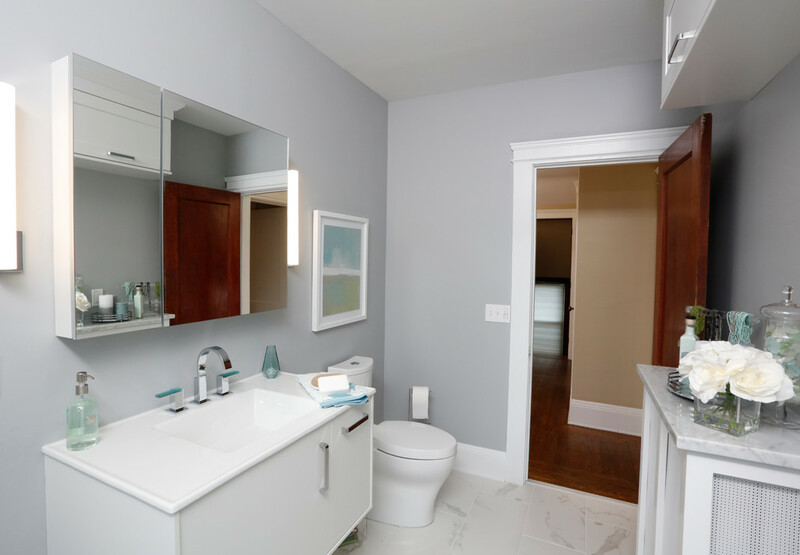 Dover proposed a new layout that included a vanity with ample lighting, tub/shower combination and extra storage—with all design elements and fixtures reflecting a modern vibe, while honoring the integrity of the 1914 home. Our team started by completing the demo, removing the rest of the plaster walls and ceiling, and taking out the mud-base floor. We discovered floor joists that were rotted and a ceiling that was not level. Major plumbing issues were uncovered, as well: The stack had a hole in it and the opened ceiling revealed a crack in the pipes in the bathroom above. All plumbing and structural concerns were corrected and upgraded to code. The existing bathroom lights had individual switches located in the middle of the room, not by the door, requiring one to enter the room in the dark. 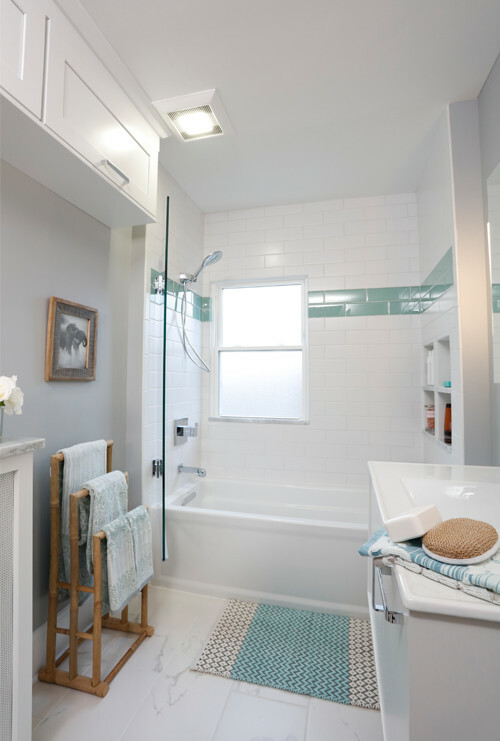 The renovation corrected the poor functional elements while completely transforming the forgotten space, creating a beautiful bathroom retreat. 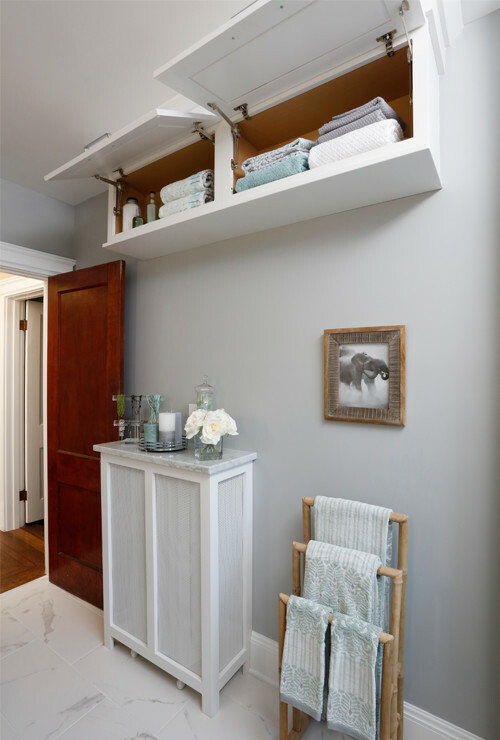 When we met for plumbing selections, the husband saw a floating vanity in the showroom and decided they had to have it (Kohler “Jute” Wall Mounted 36″ vanity in White Linen). 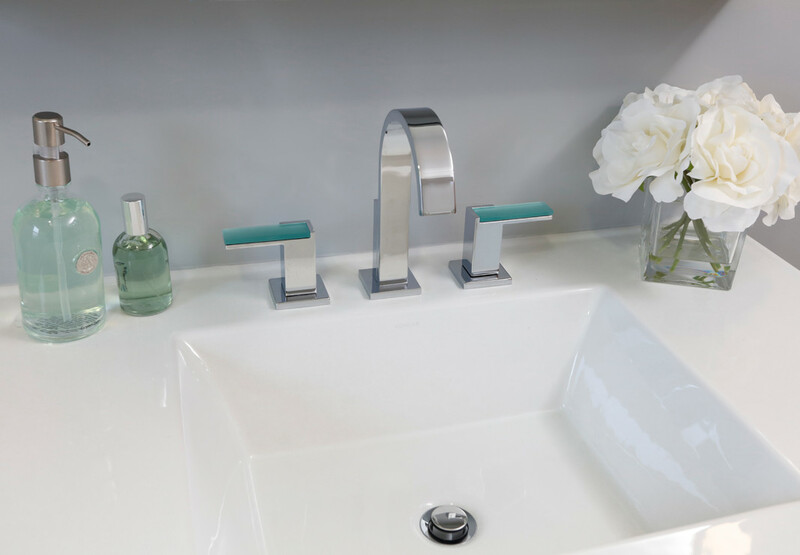 That single piece was the impetus for the entire design, leading us to the faucet selection: Brizo “Siderna” with Aqua Accent with its dynamic shape and a polished chrome finish. 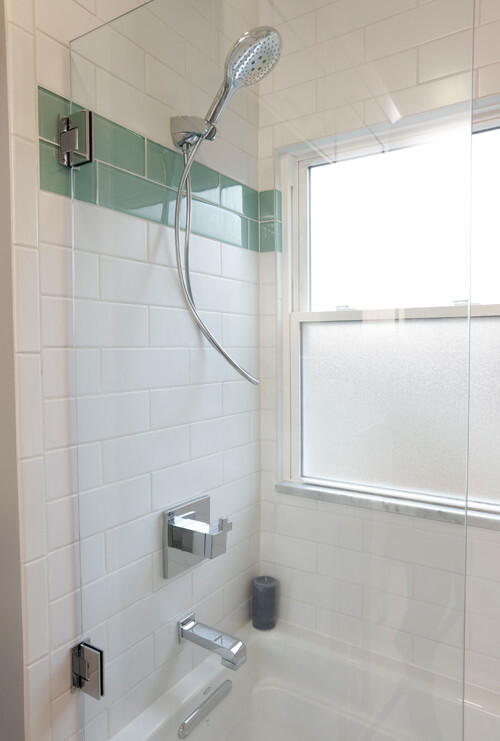 To keep the light, open feel, a frameless, hinged glass panel door by Crystal Illusions in chrome encloses the tub/shower as needed. 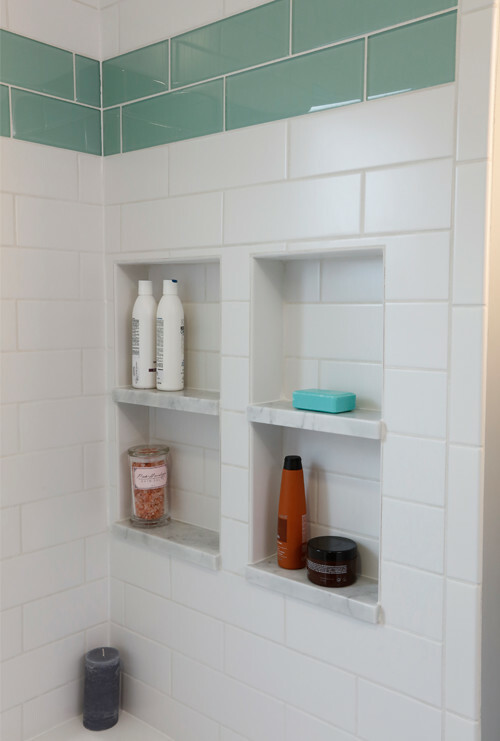 We used materials that echoed the home’s heritage, like traditional white subway tile, but then updated the look to a larger 4” x 12” format. 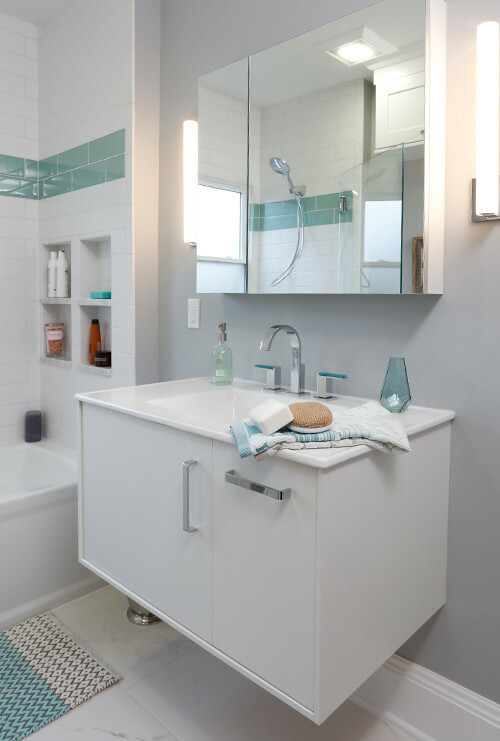 Our designer added personal touches to make the space unique: Aqua is the wife’s favorite color, which is incorporated in glass subway accent tiles and in sink faucet handles. The husband is fond of Carrera marble, so we chose a 12” x 24” porcelain floor tile that looked like marble (Ceramic Tile International in Classic Calacatta), and set it in a brick pattern. We then used actual Carrera marble in several areas—the window sill, shower niche shelves and a top for the custom radiator cover–to tie in with the flooring. LED tube lights were installed on a dimmer switch, affording high-quality task lighting that can be softened to a subtle glow. Balance was created between the mirror and vanity by having the larger doors open in opposition to one another. 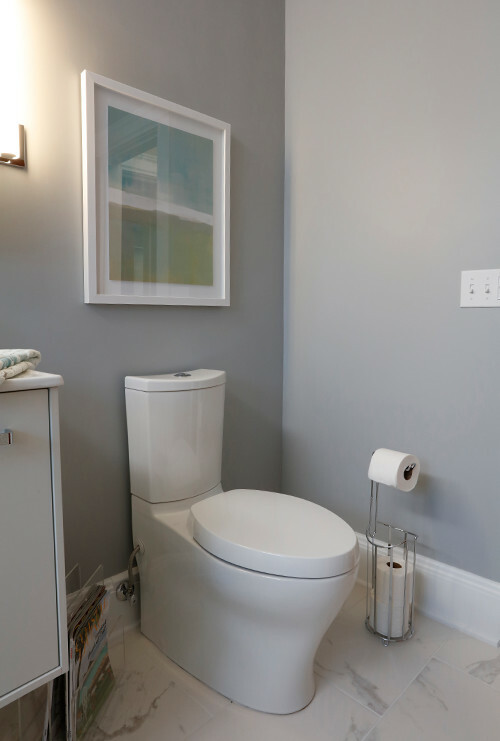 The skirted, sleek toilet (“Persuade” by Kohler) —with a nightlight hidden in the seat—adds to the clean, modern design of the space. Storage was a concern, so we took advantage of the 101” high ceiling by installing two 30” x 10” wall-mounted cabinets with top-hinged doors. The cabinets were trimmed out with traditional crown molding, maintaining the integrity of this 1913 home. 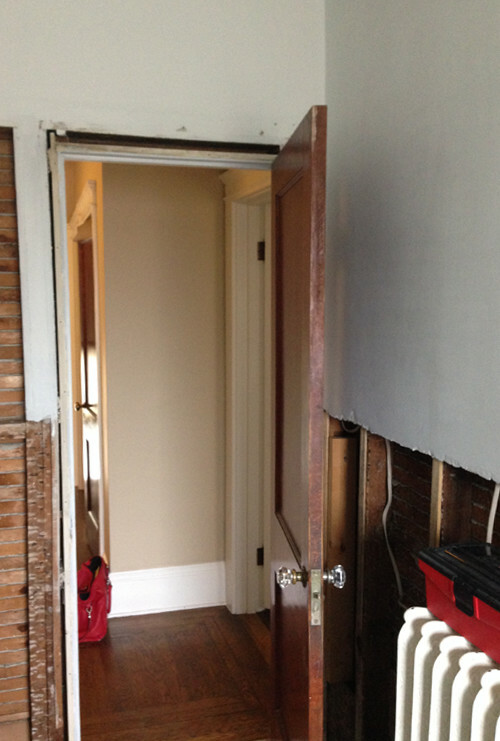 Wide door casing and baseboards continue the look. In the end, balance was achieved in this bathroom by respecting the past through use of classic materials and acknowledging the present with modern elements that reflect the homeowners’ personal aesthetics.